We pick you up – fully equipped, at your guesthouse or airport and drive to Augrabies. On our way we visit a wine cellars for wine tasting, as well as a dried fruit farm stall to sample to local produce. Check in at Augrabies and have lunch prepared by your guide. Walk to this 70m high Falls (6th largest in the world) We spend our time doing various game drives to visit the impressive viewpoints. Game such as Giraffe, Klipspringer and Dassies abound here. It’s a Bird lovers paradise, with 260 species. Guests can decide if they would like to do a 5km hike or just relax at the pool. Optional night drive with rangers. and drive 260km to the first camp at Kgalagadi – Twee Rivieren. In the Molopo riverbed we stop at the Khomani San Bushmen to view there art and crafts. On arrival at TR we check in at the reception. Here we will get info about night game drives with rangers. (Optional and departing from reception one hour before gates close) Move into your lodge (rustic, but clean, comfortable accommodation with air conditioning) Your tour guide will prepare a meal for you using your kitchen facilities. 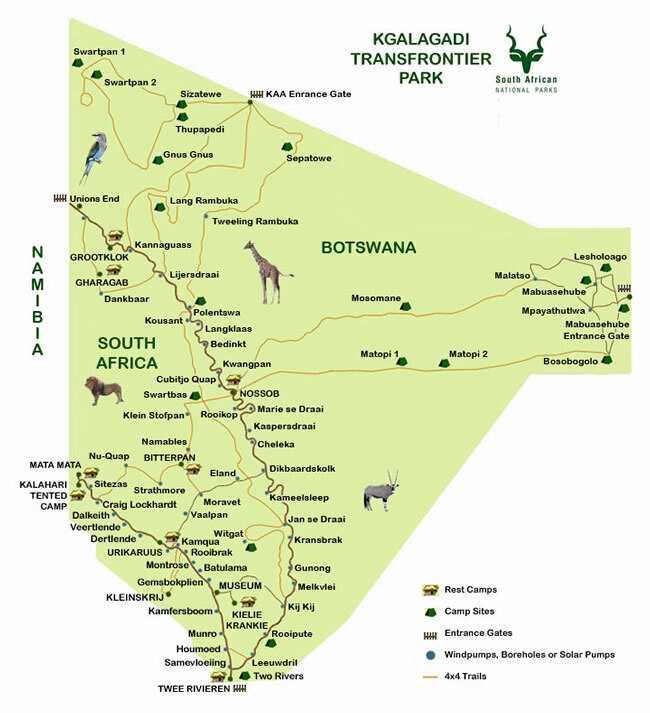 After a short rest (or a swim at the pool) we go on a game drive to explore this 38 000km Park. Endemic game: Springbok, Gemsbok, Red Hartebees, Blue Wildebees, Eland, Giraffe and Steenbok. Good sightings of Lion, Cheetah, Leopard, Brown- and Spotted Hyena do occur. Birds: 264 species including 20 large Raptors. The heaviest flying bird – Kori Bustard – is common, as well as the stately Secretary. We do game maximum game drives in this area until the gates close. Should you do a night drive you will be back one hour before departure of drive. The largest shop in Kgalagadi is available for souveniers. Early wake up for this last day of your adventure! We do slow game driving South along the riverbed to see as much as possible. Is today the day we will see the funny Meerkat? Or the King of them all – the famous Black Mane Kalahari Lion… You can always expect something new in the Kalahari! Every day has its surprises: From the black backed jackal trotting along the valley, to the Cheetah having its lunch under a tree. Afternoon arrival at TR. Your guide will fill the car with fuel, while you can visit the shop and toilet. We drive down to reception to check out, and say goodbye to the Kalahari! After a scenic drive through the farmland we arrive in time for you flight back home, or the guesthouse of your choice. End of tour. Excluded: conservation fee of R180 pppn, payable at Kgalagadi by credit card or cash and Augrabies R100 pppn, optional activities like night drives with rangers @ R145 pp, soft drinks, alcohol and bottled water. Accommodation before/after the tour. Flight- or bus tickets.